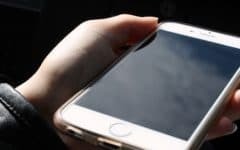 Though eBay has systems and policies in place to limit dishonest buying, there are certain times when you may not want to sell your items to certain users anyway. They may live in countries that you don’t want to (or can’t) ship to. You may catch them engaging in potentially shady buying practices. Or they may already have penalties on their account. Fortunately, you’re allowed to set general controls on who can buy or bid on items that you’re selling on eBay.com. You can also block specific users from buying or bidding on your wares, and you can even designate buyers whom you trust as exemptions to the buyer restriction rules that you set. 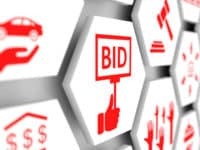 And, if all else fails, you can cancel a purchase, bid, or accepted price offer that a buyer has made on one of your items (in certain situations). This tutorial will show you how to do all of these things. What are eBay Buyer Requirements? “Buyer Requirements” are a set of filters that you can use to automatically prevent buyers who fail to meet certain criteria from buying or bidding on anything that you sell. This saves you the trouble of having to having to block each individual buyer whom you don’t want to deal with one-by-one. We should warn you, though, against setting up “Buyer Requirements” that are too numerous or too strict. 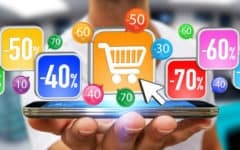 This may end up severely shrinking the pool of people who are able to potentially buy your wares, which can make it difficult to sell your items at all. 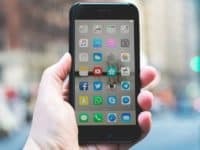 This can be especially problematic if you’re just starting out selling and don’t have an established client base yet. Open your web browser of choice and navigate to www.ebay.com. Once there, log into your account. Move your mouse cursor over your name in the top-left corner of the home page. 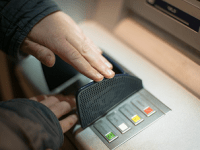 A drop-down menu should appear; select Account Settings from it. 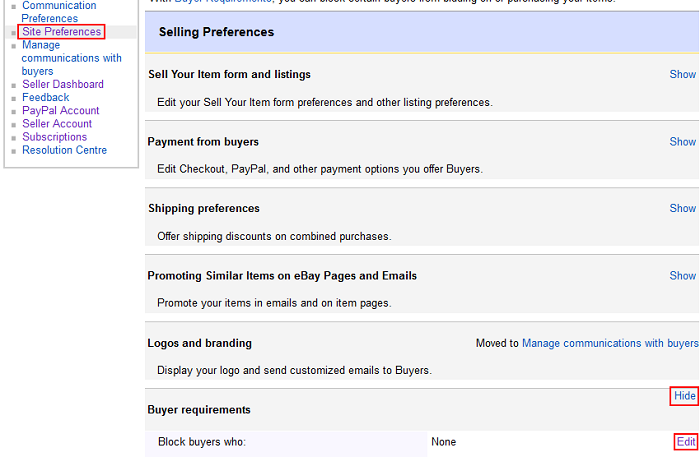 Once you’re on your “Account Settings” page, click Site Preferences in the “My eBay Views” box. Scroll down to “Buyer Requirements”, click Show, and then click Edit. You can also choose to apply these restrictions to any listings that you currently have active (though this won’t affect bids already placed on them) in addition to any future listings that you create. In addition, you can choose to prevent any users whom your restrictions would block from even contacting you over eBay. When you’re done, click Submit. If a buyer or bidder has caused (or is causing) you problems, but is somehow still slipping through your “Buyer Requirements” rules that you set, you can block them individually. Simply type their user name into your “Blocked Bidder/Buyer List”, and they’ll be unable to buy or bid on anything that you sell. They also won’t be able to contact you over eBay. You can block up to 5000 individual users at once. 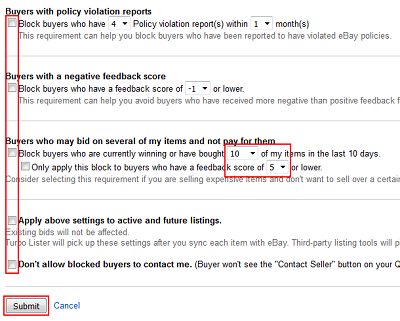 Follow steps 1 through 3 in the “How to Set eBay Buyer Requirements” section above. Under the “Buyer Requirements” heading, click Buyer Requirements Exemption List. 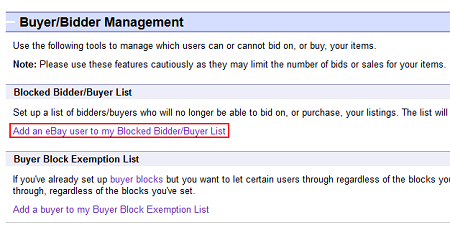 When you reach the buyer and bidder management page, under “Blocked Bidder/Buyer List,” click Add an eBay User to My Blocked Bidder/Buyer List. On the next page, click in the box labelled “Blocked Bidder/Buyer List” and type in the email addresses or user names of people whom you’d like to block from buying or bidding on your items for sale. Be sure to separate each user name or address with a comma, like in the example below. You can also erase users from the list if you don’t want to block them anymore. Click Submit to finalize your changes. Even if you have set up general restrictions on who can bid for or buy your items for sale, you may trust certain bidders or buyers enough to let them buy from you anytime. In this case, you can set them up to be able to buy or bid on your wares even if they don’t meet your Buyer Requirements (at least at the time). Follow steps 1 and 2 in the “How to Block/Unblock Individual Bidders/Buyers” section above. 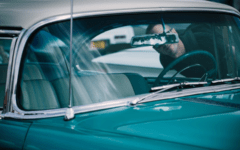 The process of adding or removing eBay users on your Buyer Requirements Exemption List is similar to what it is for your Blocked Bidder/Buyer List. 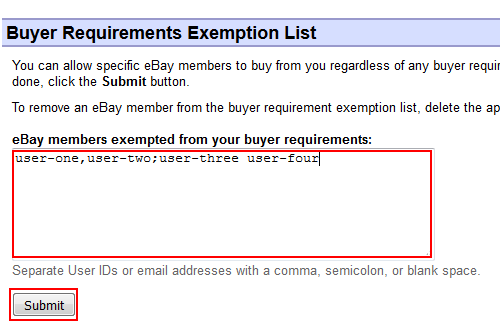 Simply click in the box labelled “eBay Members Exempted from Your Buyer Requirements” and type in the email addresses or user names of the people whom you want to be able to ignore your Buyer Requirements. Make sure to separate each user name or address with a comma, a semicolon, or a blank space, like in the example above. And, again, you can erase users from the list if you no longer want them to be exempt from your Buyer Requirements. When you’re finished making changes, click Submit. 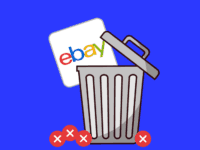 Sometimes, a buyer may ask you to cancel their bid on one of the items that you’ve put up for auction (see our article on how to cancel a bid on eBay as a buyer to learn when they have a legitimate reason for doing so). Other times, you may have your own reasons for wanting to cancel a bid on an item that you’re auctioning off. For example, you may not be able to verify the identity of a seller, or you may be planning on ending your listing early. To cancel a bid for one of your items up for auction, click this link and log into your eBay account (if you haven’t already done so). Then, enter your listing ID number, the user ID of the bidder whose bid you want to cancel, and the reason you want to cancel the bid. Finally, click Cancel Bid. Well, that’s about everything that you need to know in order to keep unwanted buyers or bidders off your back on eBay. Next, we’ll talk about what you should do once you do find a buyer that you like and are ready to ship an order on eBay. 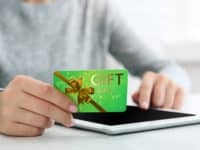 How Do I Access My Money After I Sell Items on eBay?